The post of today brings us back to the northeastern part of Italy, in Friuli. An agricultural region of mountains, plains and rivers bounded on the west by the Livenza River, on the north by the Carnic Alps, on the east by the Julian Alps and the Timavo River, and on the south by the Adriatic Sea. Rivers flowing southwards from the mountains are numerous, crossing through and dividing the gentle rolling hills then the plains as they go down. The climate of the Friulian plains, commonly divided into the High Friulian plain and the Low Friulian plain, is humid sub-Mediterranean. The climate in this area is highly suitable for growing white wine grapes, and 2.5% of wine produced in Italy comes from this part of the Friuli region. The areas in the hills, however, have a continental climate, and the mountainous regions have an alpine climate. Friuli evokes white wines with a lot of freshness and minerality, made with the famous Pinot Grigio (Pinot Gris) and Tocai Friulano (which soon should only become “Friulano” for Hungary claims the right on the name of the grape, spelled Tokaj, thus to avoid the occasional confusion between the dry white from Italy and the famous and long established dessert wine from Hungary; which is also why, for the same reason, “Tokay Pinot Gris” in Alsce, France, became “Pinot Gris” only). But also other grapes like Chardonnay, Müller-Thurgau, Pinot Bianco, Pinot Grigio, Ribolla Gialla, Riesling Italiaco and Riesling Renano, Sauvignon Blanc, Traminer Aromatico, Verduzzo and Malvasia Istriana. The region is known for two particular DOC: Colli Orientali del Friuli and Friuli Grave. Yet, Friuli also produces lesser-known reds made from Pinot noir (Pinot Nero), Lagrein, Cabernet Franc, Cabernet Sauvignon, Collio and Collio Cabernet, Merlot, Pignolo, Refosco dal Peduncolo Rosso, Tazzelenghe, Terran, and more especially for this post, Schioppettino (better known as Ribolla Nera). When the owner of Cantarutti came to introduce his wines to me at the store, in need to admit that I was quite impressed by their quality and consistency from one wine to another, yet the Schioppettino 2001 was the most surprising of the bunch. Established in the late 60s and nestled in the north of San Giovanni al Natisone, a village southeast of Udine in the middle of the Rosazzo hills, Cantarutti is a family run winery located in the Friuli “Grave”, the largest DOC zone in the Friuli-Venezia Giulia region, producing over 40 percent of this region's DOC wines. The word “Grave”, like in Bordeaux, indicates the presence of gravelly terrain throughout the area, covered with small round pebbles (rolled by the melting glaciers during the last ice age and the slowly lowering sea level that occurred a long time after). The estate possesses about 54 hectares of vines and produces about 150.000 bottles a year in their brand new cellar that can contain up to 500 barrels. 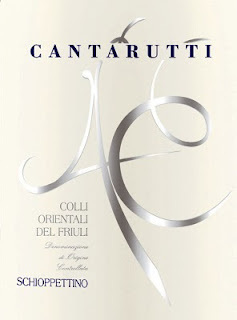 Cantarutti has made major investments in the winery in the last few years creating a state of the art fermentation facility and beautiful underground cellars for the aging of the wines. The vineyards are planted with pretty much all the authorized grapes cited above. Deep golden color, clean and creamy, a touch nutty, quite viscous and agreeable overall, yet a bit different from the usually boring Pinot Grigio out there but not at its best either. May be I should retry it, because the color and the slight nutty touch remind me more of a slight oxidation rather the actual or willing style of the producer. Here again, the color is deeper than I’m used to for this type of wine. Richer and creamier than the above sibling with more personality and vibrancy, complemented by a lovely structure and enhancing acidity. White fruit and peach with zesty touch and minerality are the main features of this enjoyable white. Compared to the above wines from “Grave”, this wine exhibits a totally different spectrum of color, aromas and attitude. The color is clean, pale yellow with green metallic reflects, like almost diluted. The nose is fresh with white blossom and white fruit aromas, minerals and lemon peel hints, yet it seems timid, somewhat restrained. In the palate, the wine is much expressive with flavors of apple and citrus with, here again, white blossom and mineral notes. The finish is long and inviting. The overall wine is clean, bright and vibrant with a lovely texture and enhancing acidity. Excellent. Day and night between the Grave Pinot Grigio and its Colli Orientali counter-part. The wine underwent a long fermentation in stainless steel tanks to fully extract the entire component of the grapes and allow for better ageing potential. The resulting wine is beautiful, with the same type of profile and attitude as the Ribolla Gialla above. Beautiful. First, I never tried “Schioppettino” before, and I need to admit, I was quite impressed. Everyone who knows my palate well, will tell you that I usually despise the overripe fruit bomb and massively oaky wines, and that I rather like vibrant wine with ideally ripe fruit, interesting character and nuances, harmonious balance and long inviting finish, presenting great acidity and some integrated tannins important for the structure and the ageing potential. Well, with this wine, I was served! Moreover, like their Pinot Nero, Pignolo and Refosco dal Peduncolo Rosso, this wine is only crafted in particularly good vintage, when the Schioppettino grape (also known as Ribolla Nera) can attain full ripeness and required maturity to be bottled on its own, otherwise it is used as part of the blend for other red wines. This is 2001 and the next vintage will be 2003. Secondly, this wine is aged in new 300 liters barrels for 18 months in Hungarian oak, and then put back for 3-4 months in stainless steel tank to settle down and integrate before bottling. And finally spent another 10-12 months in the bottle before release to arrive on your table in perfect condition. Its color is the one of the slightly aged red wine made with grapes adapted to cooler climate (like Pinot Noir, etc..), light to medium intensity, quite see through, garnet old red cherry-like with brick-orange touches on the rim. The nose is very expressive, perfumy, earthy, fresh and floral, with spices and tertiary aromas that evoke the fall season: underbrush, forest floor, mushroom, garrigues and balsamic. The palate is fairly light and bright, with excellent acidity and balance, elegant structure and texture with dark and red berries flavors complemented with spices, earthy and minerals notes. The finish is very long with slight oak notes and integrated tannins. I loved it. Pair it with venison, game, poultry, white meat like veal stew or pork, and cheeses. Overall, I can say that these wines were solid and well crafted, quite approachable yet not necessarily your everyday wines, especially the red. They need some food to fully express themselves and will satisfy the racy, mineral wine lovers like me. THe Colli Orientali vintages are destined to become classic. The red and white range powerful aromas and intense fruit taste and tannins.